It's that time of year, dear friends. It's his birthday again! And as usual I am using that as inspiration to write. I've written several times in the past about my brother. That's what happens when you grow up with your best friend, you have too many stories to share. Perhaps I should save some of these, but genuinely, time with him is time well spent. I forgot what I wanted to get him for his birthday this year until after I ordered his gift online and it was well on its way. I am happy with what I bought him but I am sad that I did not get him what I wanted to, and forgot about, and that was a record. We grew up listening to records in his bedroom. We would put There's a Hippo in my Bathtub on repeat, playing it at double time and laughing at the helium huffing sounding Anne Murray: "Why can't a cow have kittens, why-ee-why-ee-why". Imagine a chipmunk singing you those lines and that's how it sounded at 78rpm. We would giggle and ask our parents the same question. They must have thought we were nuts. We moved on to the Ooga-Chaga, and we would put that on 33rpm and laugh at the slow motion sounding voices coming from the needle. Oooooo-gaaaaa-chaaaaa-gaaaa (I'll spare you from reading that repeatedly). At the chorus we would put it to 45 and rock out to "I, I'm hooked on a feeling!' It was a sad day when I left that record out in the sun and warped the small vinyl. He was the only one in the house to have his own record player, probably the only one responsible enough, out of the younger ones to take care of such a contraption. It was a blue and white briefcase that he cared for like it was a living thing. I was often too scared to load the record. 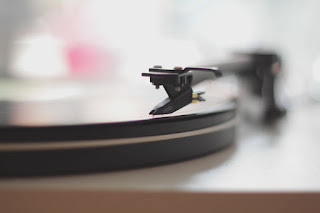 Our dad would grit his teeth and sometimes yell if he heard the needle scratching but my brother was one of the few that could gently and meticulously load the needle on the turn table. I watched in awe as he would slide the large plates from their sleeves and pop them on the player. The patient and steady hands of a surgeon. When our parents were away we would sneak into my dad's office and watch the automatic player load the record. It was elegant and sleek. The side light lit up in red when it was loading, and then blue once it made contact with the vinyl. The arm would automatically lift from its resting position, swing gracefully over to the edge and drop precisely onto the spinning, glossy black disk. The velvety sound would flow through the speakers and fill the house with rich sonics. So, Dragon, know that your birthday present is on its way. I'm sorry that it is not a record. It is something else from our childhood that I hope brings you joy. And know that you have been one of the most influential people in my life. You have brought many things, including a love for good music into my life. I may try to be cool like you one day and get a record player briefcase that I can show off to my friends. But I'll probably leave it out in the sun again and melt my collection. I will set a reminder for the next occasion to be sure you have "Ooga Chaga" in your collection. Happy birthday, Mike.